Measuring rainfall is very important for gardeners, people working in agriculture, farmers, meteorologists, weather hobbyists and yes especially for people that use rainbarrels.Measuring rainfall can be done with a commercial rain guage,pluviometer, or a homemade rain guage. Just a little history about the first rain gauge. It is believed to have been invented more than 2,000 years ago. It was invented in Korea in 1441 by King Sejong the Great (1394-1450) the country's finest king and most respected person in Korean history. The first known records of rainfall were kept by the ancient Greeks about around 500 B.C. This was followed 100 years later by people in India using bowls to record the rainfall. 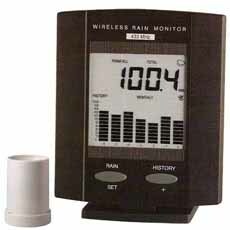 A Rain gauge comes in both wireless and cabled versions, and in recording and non recording, the non recording type is the more common. The Oregon Scientific RGR122 Cable Free Long Range Rain guage, for example, has an effective range of 300 feet, transmitting the signal back from the collector to a base unit. Cabled rain gauges from Oregon Scientific and La Crosse are affordable and can be placed around 30 feet from a base unit. A Rain guage also comes in self emptying versions where the accumulated rainfall is automatically dumped when it reaches it's limit at a predetermined time. Some even come with outdoor temperature sensors. Other wireless rain gauges can give you rainfall daily, weekly, monthly accumulations and day, date and time of the rainfall. 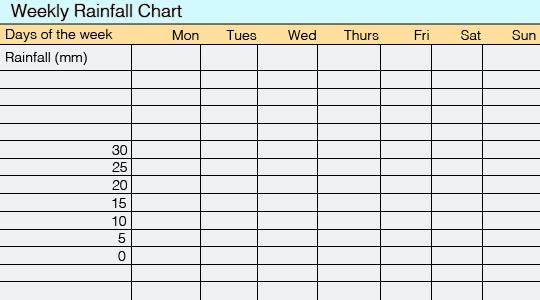 On some models, you can even have a historical graph of your rainfall. It really depends on the features of the rain guage. Transmission can vary from 30 seconds during a rainfall to a couple of minutes with no rain transmissions. Number of minutes depends on the device being used. Some devices will give you the rainfall for the past 24 hours or last hour. You can buy a decent wireless rain guage for around 30-40$. The more features it has the more it will cost, but again this depends on how much detail you want to have. For the purpose of collecting rain in rainbarrels, either making your own rain guage or simply buying one is totally up to you. It Depends how much detail you want to collect. Personally I would buy one since I like the fact of it being wireless and I like precision and also keeping a track record of monthly rainfalls is always interesting. Measuring rainfall is usually done in millimeters or inches. Light rainfall is less than 0.10 inches, isn't very wet. If you were caught in it, you'd only get a little sprinkling. Moderate rainfall measures 0.10 to 0.30 inches of rain per hour. This amount of rain would make you wet if you were playing outside, and it would be easy to see. Heavy rainfall is more than 0.30 inches of rain per hour, we all know the famous expression, "It's raining cats and dogs". Remember that you need about one inch of rain/week to sustain outdoor plants. So having a rain guage you make at home or one that you bought comes in handy. A rain guage should be placed on the ground and high enough to avoid splashes or drops of water which may come from trees, electric lines or buildings.